The North Carolina Medical Society was founded in 1849 "to unite, serve, and represent physicians, in order to enhance physician advocacy for their patients, and improve the health of the people of North Carolina." As early as 1790, some state leaders had attempted to organize the medical profession in North Carolina. The idea languished until the General Assembly created a corporation called the North Carolina Medical Society in 1799. According to the Raleigh Register, the new organization would enable the community "to distinguish the true physician from the ignorant pretender" and possibly to suppress "the fatal and criminal practices of quacks." The society remained active until the early 1800s, when it ceased to exist. North Carolina was consequently not represented at the first American Medical Association Convention in 1847. That situation was rectified in 1849 with the founding of the modern North Carolina Medical Society, which, as of the early 2000s, has held meetings every year except for three years during the Civil War and one year during World War II. The modern society has approximately 10,000 members, comprising physicians and physician assistants throughout the state. An executive vice president and professional staff directs the society's operation from its headquarters in Raleigh. Despite significant growth, the Medical Society's basic objectives have remained constant since 1849. These include improving all areas of the medical profession to increase its effectiveness, giving the state's medical personnel the opportunity to practice in a dedicated and advanced professional environment, and publicizing and eliminating problems where they may occur. The society also stresses the importance of national organization, particularly through its membership in the American Medical Association. Dorothy Long, ed., Medicine in North Carolina: Essays in the History of Medical Science and Medical Service, 1524-1960 (2 vols., 1972). 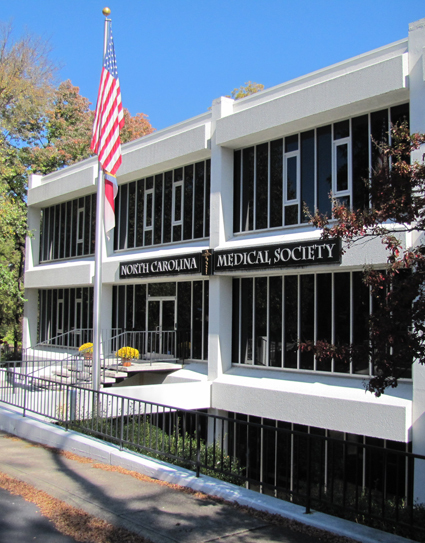 "Medical Society Of North Carolina." N.C. Highway Historical Marker H-70, N.C. Office of Archives & History. http://www.ncmarkers.com/Markers.aspx?sp=Markers&k=Markers&sv=H-70 (accessed January 22, 2013). Long, John Wesley. "Early History of the North Carolina Medical Society." Transactions of the Medical Society of the State of North Carolina Sixty Fourth Annual Meeting Held at Asheville, North Carolina, April 17, 18, 19, 1919. Raleigh, N.C.: Edwards and Broughton. 1917. 331-349. http://books.google.com/books?id=ffefAAAAMAAJ&pg=PA331#v=onepage&q&f=false (accessed March 8, 2013).